As the weather turns cold and the leaves begin to fall off the trees, our feathered friends will begin their impressive migrations to warmer climes, but not before turning city parks and other areas into birding hotspots. To that end, if we weren’t on our round the world trip right now, we would be stalking the rushes at Confederation Park hoping to catch a glimpse of an uncommon warbler in the city, or a waterthrush stocking up on food before alighting to sunnier destinations. While we’re aware that not everybody is not even remotely interested in birding or birdwatching, everyone should care about what happens to them. Birds are so closely tied to their ecosystems that they are often the first creatures to let us know that something is wrong. 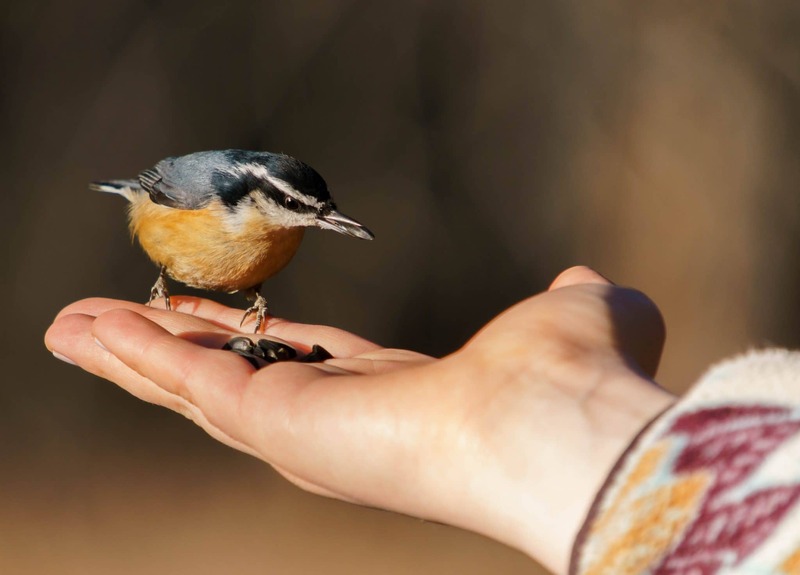 They are indeed the proverbial canaries in the coalmine acting as indicators of sustainability and ecosystem health, so caring for the birds means caring for the world. We have no doubt been given a hard time for our love of birds, since a lot of people associate birding with old men in safari clothes carrying thousands of dollars worth of camera gear and binoculars who run around obsessively crossing off species on their life lists. Also, some people think of nuisance pigeons when they hear the word bird, but there are so many other species out there and birding can be as casual as you want it to be. So with that in mind, here are the reasons why we’re #nutsaboutbirds. Between cellphones, Netflix, video games, and the bottomless pit of depravity that is the internet, there have never been more distractions to keep people inside. Birding on the other hand, almost always requires you to get outside to a city park, wetland, or nature reserve and spend some time in the great outdoors. Connecting with nature is incredibly good for the health and birding allows you to make it as physically intense or as relaxed as you want. 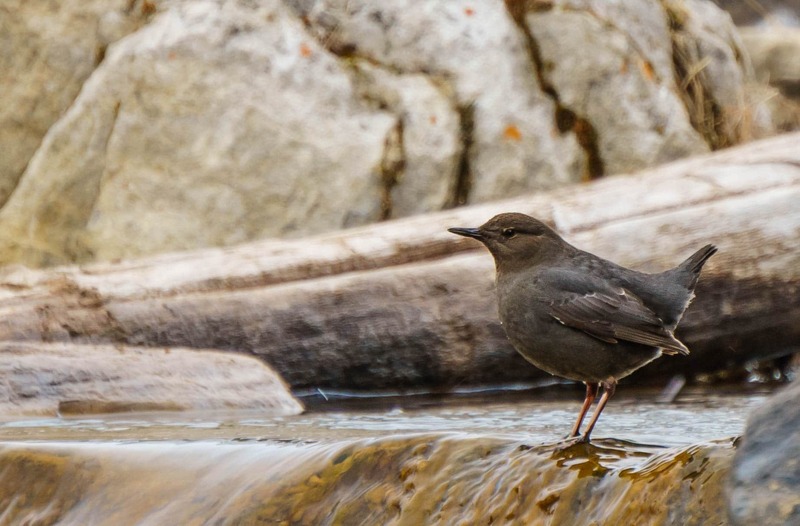 American Dipper photographed at Banff National Park. Although an inconspicuous-looking bird, their tendency to frequent only fast moving alpine streams where they demonstrate their namesake behaviour, as well as their beautiful songs make dippers one of my favourite birds! We sometimes bring our big lenses and binoculars up to the tops of mountains with the aim of spotting some of the indomitable birds that somehow live in high alpine environments. 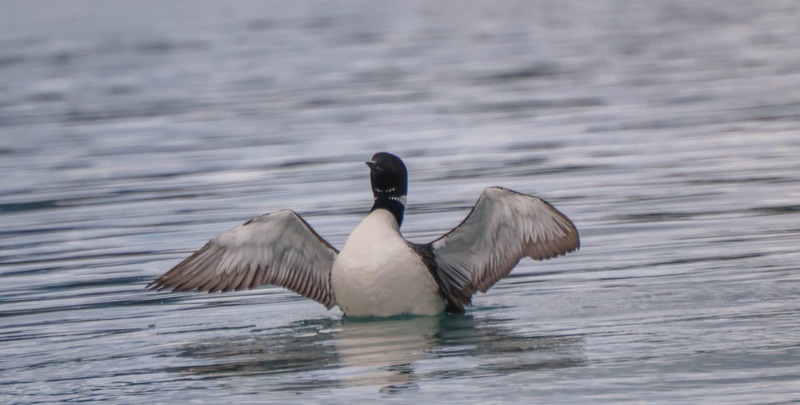 We have also cycled around Calgary to various birding hot spots such as the Inglewood Bird Sanctuary where you can see their resident wood ducks, a species that was almost hunted to extinction but an international treaty between Canada and the US saved them. We have also cycled to the Mattamy wetlands which are a manufactured landscape that comes alive in summer with multiple species of migratory shorebirds (and one poor, lonely misplaced harlequin duck one year!). On cold winter days, we’ve simply driven around looking for the few hardy birds that stick around or come down to “summer” from the arctic like beautiful snowy owls or one of my favourites, snow buntings, aka the birds that look like toasted marshmallows. 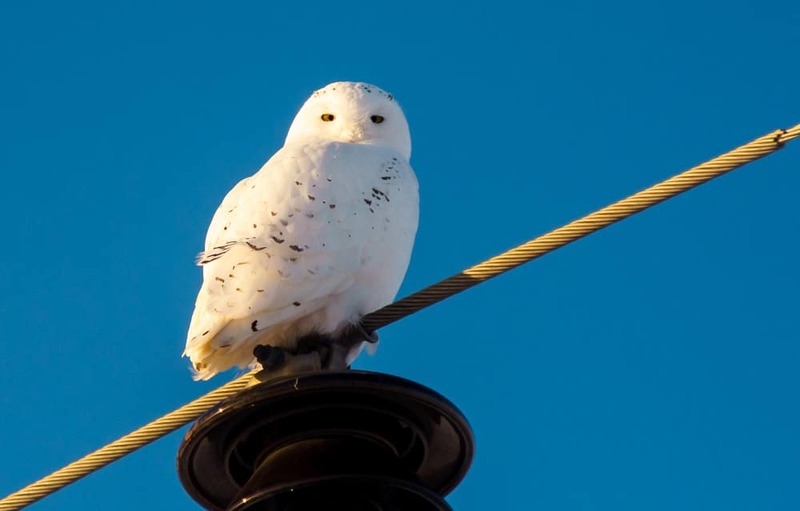 Snowy owl looking majestic on a pole. Birding requires tuning out the rest of the world and focusing only on the natural environment in front of you. There’s the thrill of the hunt too when searching for a chance to spot a new species, kind of like playing PokemonGo with nature. 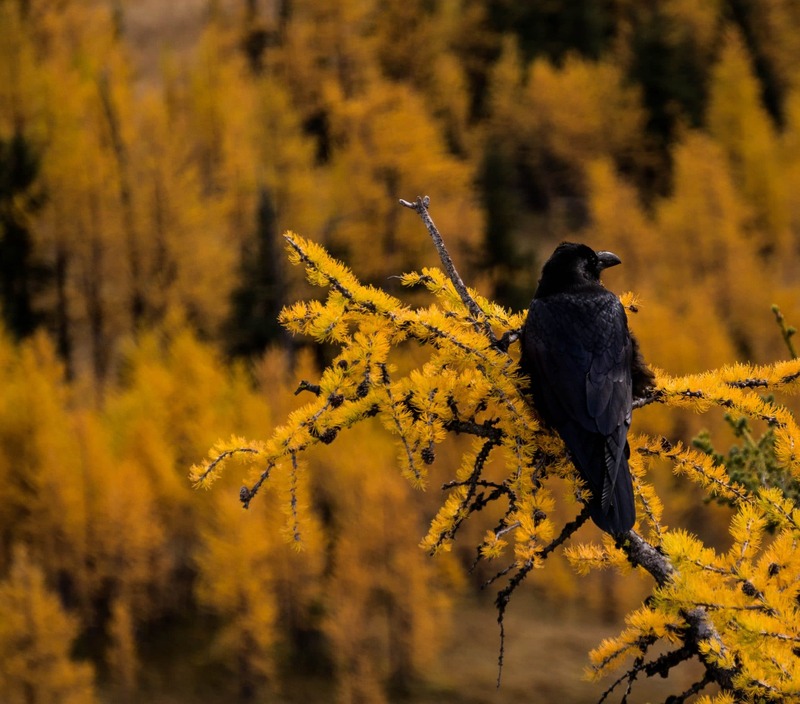 Common raven has the best seat in the house during larch season in Banff National Park. Some of the best bird sightings can be seen right in the city, or even in your own yard. By making your yard bird friendly you can bring nature right to your window. All it requires is putting up some feeders, planting some preferably native trees and shrubs, taking steps to prevent fatal window collisions, and keeping your pets inside or outside only under supervision. We easily had 10 different species flitting through our inner city yard at any time, many of which visited our feeders. 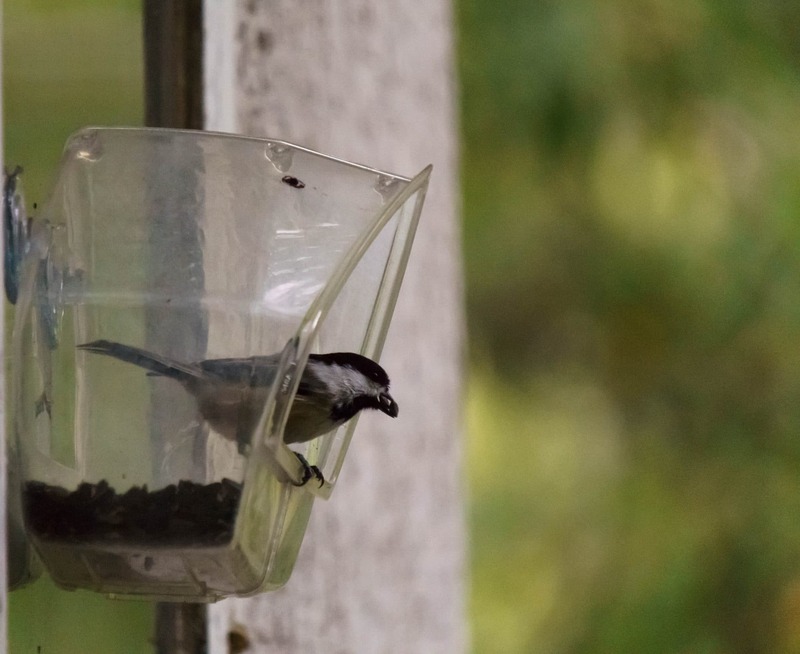 My favourite were the chickadees where the brave ones of the bunch would supervise me refilling the feeders while calling to their friends to come to the buffet. Some would even eat out of my hand! 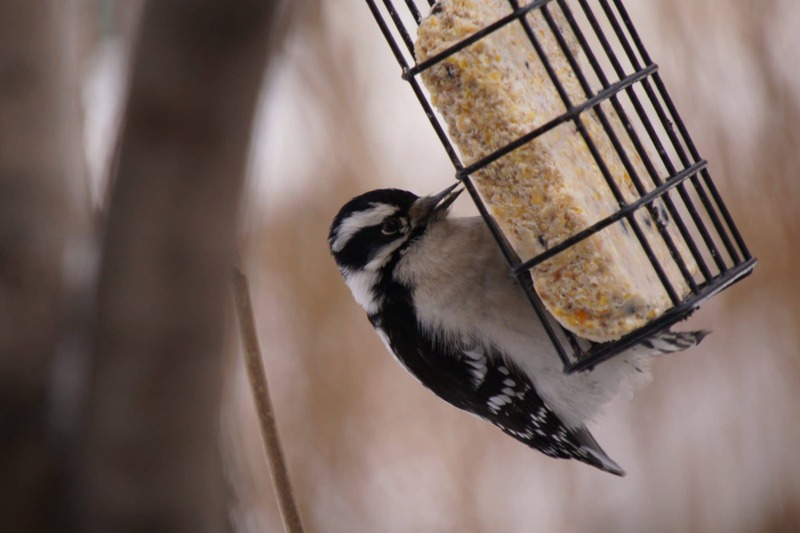 Downy woodpecker visits the suet feeder in the yard. If you have a cat, we also recommend putting up a window bird feeder which becomes like a TV for them and hilarity ensues. Our goofy cat likes to ninja kick the window when he sees the birds in the feeder. Perhaps the greatest thing about birding is that you can do it wherever you are in the world. We have spotted impressive hardy finches living at 5200m in Huayana Potosi’s basecamp in Bolivia, sat in hummingbird gardens in Mindo, Ecuador and marvelled at the tremendous bio-diversity of these charming little creatures, and watched in awe as the majestic condors soared over the Colca Canyon in Peru. 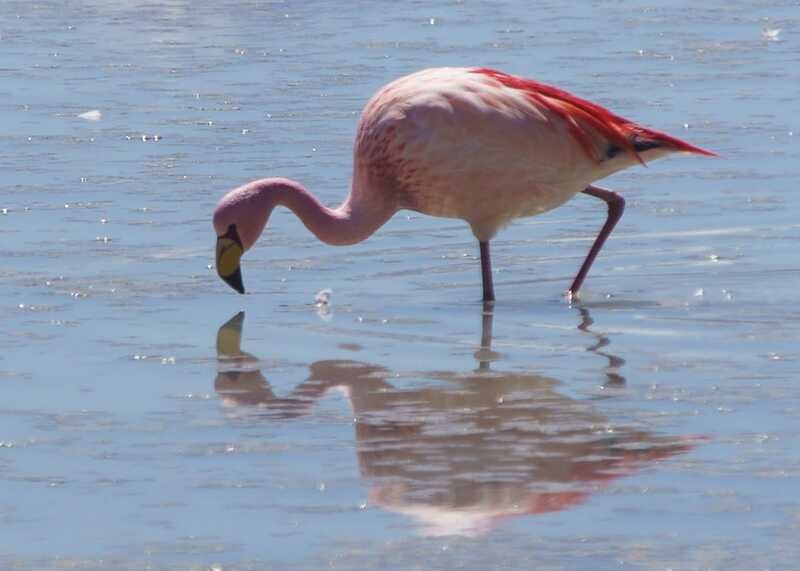 Our next birding adventure is to Amboro National Park in Bolivia which is said to be home to over 800 bird species! Looking for birds perched on electricity poles beside roads can liven up a long roadtrip, as can listening for their songs while plodding through a forest on the way to a mountaintop. Birds go wherever we go and are always there to greet us with their songs or brighten up our surroundings. 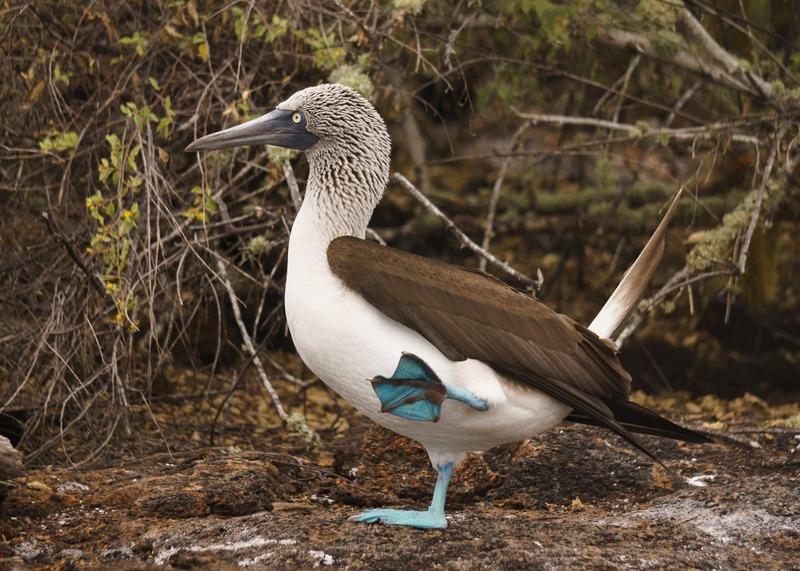 Silly blue Footed Booby shows off his famous feet to a potential mate in the Galapagos. 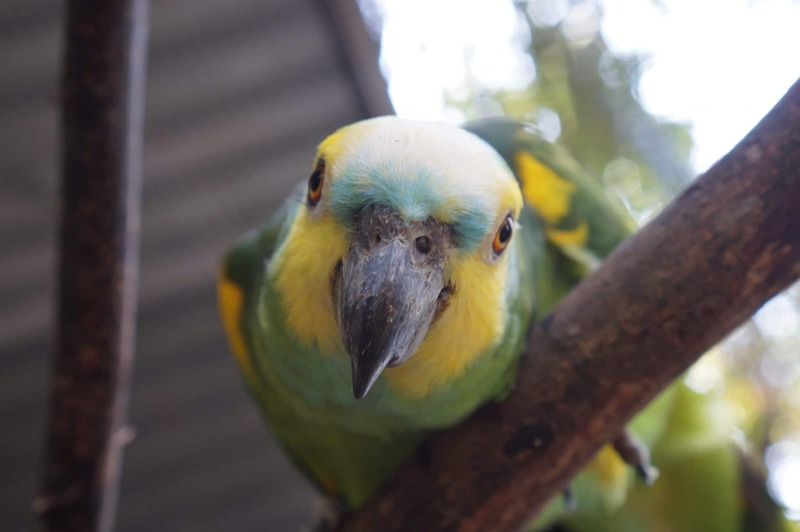 Most recently, I finished a volunteer stint working with birds that had been injured or trafficked illegally at Communidad Inti Wara Yassi (CIWY) in Bolivia. Spending time with these amazing creatures every day only deepened my appreciation of them. Also if you’re thinking of getting a bird as a pet, please do an immense amount of research first and make sure that you’re getting one from a reputable breeder and not one that has been stolen from the wild in the illegal animal trade. Many of the birds at CIWY were taken from their nests as fledglings so they never learned how to be wild and as such, can never be released. Worse, many of them had their wings intentionally broken so they were easier to control because people are horrible. Since their owners knew very little about caring for a bird, many ended up either kicked out on a city street or surrendered to CIWY when they became too much to handle or bit the family’s kid with their powerful beaks. If anything, my time at CIWY made me realise that the best bird, is a wild one. 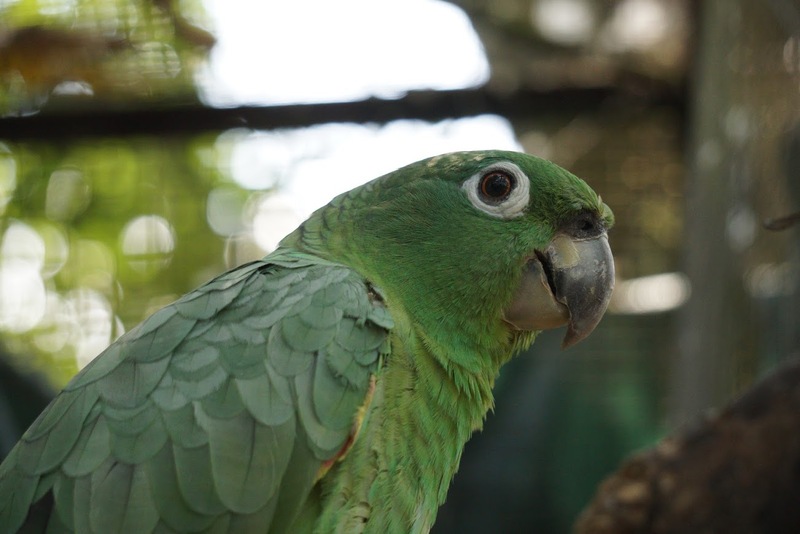 Carolina, a southern mealy parrot is a favourite among the volunteers at CIWY for her sweet demeanour and funny vocalisations. That said, she never , ever tires of making a racket, so keep that in mind when thinking about getting a parrot as a pet. It’s also incredibly easy and affordable to get started with birding. While there are no doubt organized birding tours that cost a pretty penny, beginner birding does not need to be cost prohibitive. This may cause some old school birders to gasp in horror, but I don’t even own a field guide. This is mainly because we knew we were going on a trip around the world so if I bought one it would have been one more thing to go in storage, but also because there are incredible free apps out there that make birding a breeze. 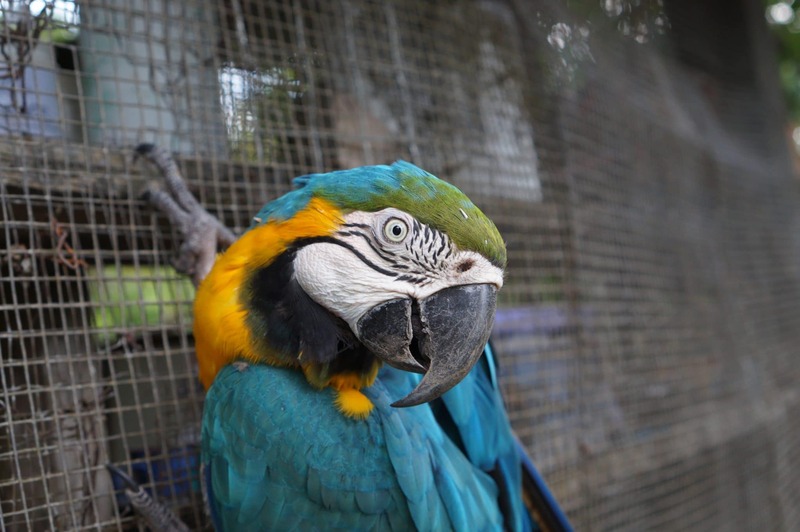 Monchito is a blue and yellow macaw that lives at CIWY. His wing is broken so he will live out the rest of his 70 year lifespan at the refuge. The free version of BirdsEye for example, will provide a list of about 100 species of birds that can be seen in your location. If you’re a casual birder like us, that’s more than enough to identify some of the local birds you may happen to spot. I find it kind of fun to load up the list before going out and seeing if there is an interesting-looking bird that I should keep an eye out for while exploring a new city or trail. Lastly, eBird will provide you with a list of local birding hotspots so you can always find a place to look for birds near you. A red-breasted nuthatch eating from my hand. These common city birds are very curious about people! I got my start in birding doing the Christmas Bird Count with my dad as a child. It was a fun tradition to go out looking for birds close to Christmas and while I didn’t understand the importance of gathering citizen-science then, I do remember enjoying running around in the snow trying to count as many birds as possible. Now we do the Christmas Bird Count with some more experienced folks in a different city and enjoy contributing invaluable citizen science to help scientists, governments, and conservation authorities understand what birds can tell us about ecosystem health. In the spirit of Gus Yaki, a somewhat famed Calgary naturalist, I also like to bring a bag to pick up trash while counting the birds as a way to give back to them a little. Pretty much every city has a conservation group or a naturalist organization, so simply look up yours and there will be all kinds of resources available to help you to get started with birding. For example, the City of Calgary runs birding workshops, as do some non-profit groups like the Friends of Fish Creek Park and Nature Calgary. These are wonderful options to get out and try a new activity in a new part of the city. 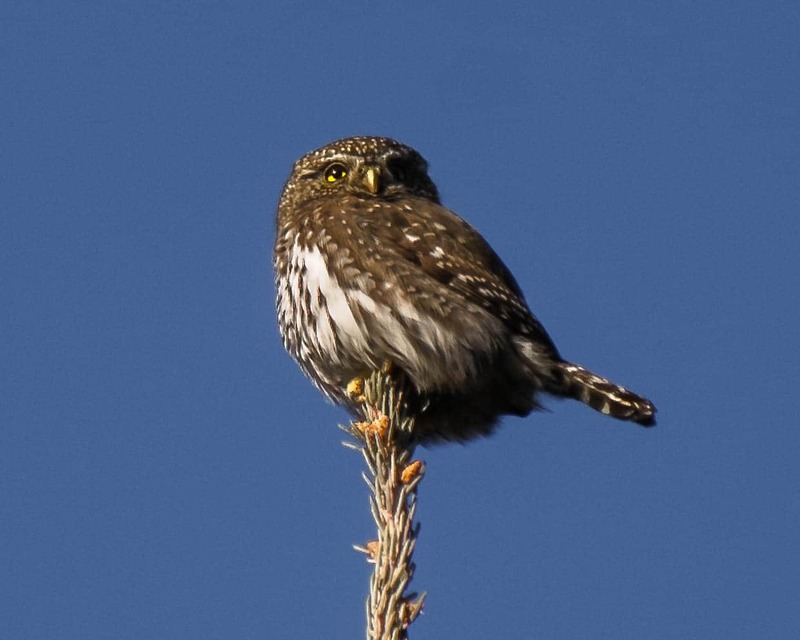 This cute little pygmy owl is an “ambassador bird”, meaning he doesn’t seem to mind all the attention he gets in the city park where he lives and can inspire people to pay more attention to birds. and an Olympus 1.7x Teleconverter for extra reach. Few animals have as much diversity as birds. Whether watching the backyard acrobatics of chickadees, one of the most common birds in North America, admiring the long elegant feathers of a peacock, marvelling at the speed with which a hummingbird flaps its wings, or trying to decide which damned LBJ you’re looking at, birding introduces you to the tremendous diversity that can be found in the natural world. 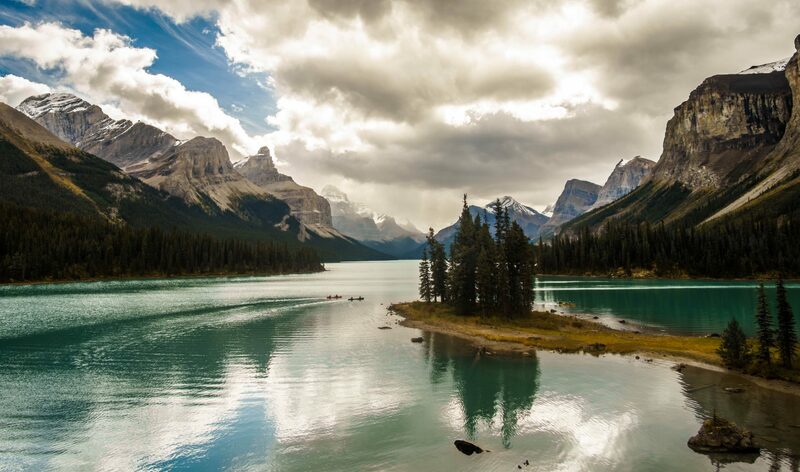 The more you realize there is to admire, the more people may care about preserving the natural places where they live. Without forests, grasslands, or even urban tree canopies, birds can’t thrive and if they can’t thrive they can’t enrich our environment. Whether you’ve rolled your eyes this entire post or are more inspired than ever to grab a field guide and try out birding, one thing for certain is that the value of birds is immeasurable. So consider paying attention to the birds around you and the environments that they call home, their world is your world too. Hey you down there! Why don’t you give birding a try?